The €105 million facility will be opened in 2019 and will house around 500 employees in 40,000 m2. 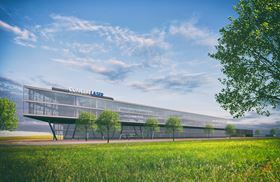 GE and Concept Laser plan to open a new additive manufacturing (AM) plant in Lichtenfels, Germany. The €105 million facility will be opened in 2019 and will house around 500 employees in 40,000 m2. It is aimed at having machine production capacity four times higher than the company’s current capacity. Kegelmann and Concept Laser have formed a partnership to improve series-production quality in 3D printing.